Consequently, it was exactly seven years ago—almost down to the day—that I had last seen Criss play in L.A., at the Roxy in Hollywood on December 18th, 2010. Though he was then a bow-tie-wearing college grad with a mop of curly black hair much thicker than his current close crop, Criss treated fans pretty similarly to how he does now. Anyone watching Criss perform has the immediate, intimate experience of knowing an artist as if they are not known at all. Throughout the December 15th performance, he talked between songs, dropping hints now and then to the various highlights of his past. To some it might have sounded as though he was distancing himself from more kiddish career moves. To those of us who had been there for the long haul, we recognized these nods as a gift just for us. 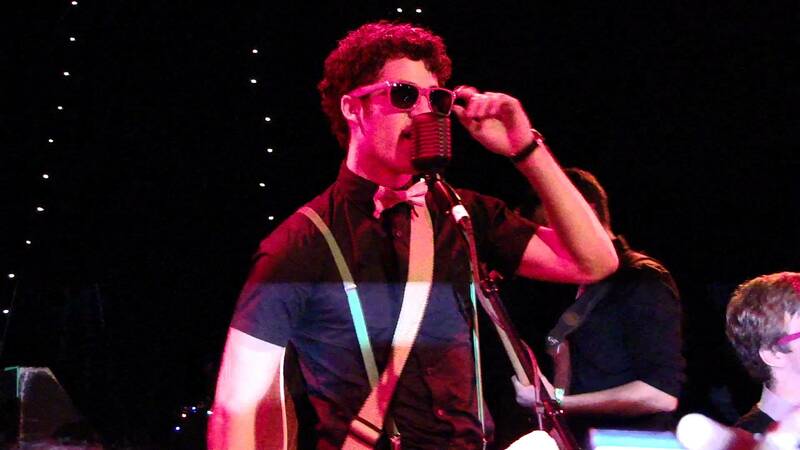 Darren Criss at the Roxy in 2010. I had been days away from seventeen when we saw him at the Roxy in 2010. My friend Nicole—who stood beside me now at the Globe—and I had driven to L.A. to see him on the cusp of his new role as Blaine Anderson on Glee, right before he launched into the public eye. As we huddled in line (in what we fondly remember as “pouring” rain), a passing couple asked us who Darren Criss was. We told them about Glee, but it seemed an incomplete answer. After all, he had pulled Human out of the seemingly endless depths of his heart and played the titular character of the best book series of all time in a musical we thought to be one of the most clever pieces of content ever created. These scraps of music and video were all we had of Darren back then; most of my memories from high school are of sharing headphones and slipping lyric-based jokes into conversation with her. Criss’s fame happened to converge with the point when Tumblr rose as the blogging platform of choice for self-proclaimed nerd girls whose truest friends were those found in fandom instead of in the classroom. The common joke was that you would tell your deepest secrets to strangers on the internet but burn everything to the ground if someone from “real life” found your blog. Beyond being somewhat irresponsible internet behavior, this attitude also betrayed a misunderstanding of what actually made up our real lives: The Tumblr-facilitated coalition of the Harry Potter fandom, the Starkid fandom, and the Glee fandom (along with a newly accessible pop-feminist ideology that still remains a pillar of the Tumblr user base today) sent many girls on the path to brazen young womanhood, which didn’t start and stop at the bounds of the web. Being an outsider was in; speaking up about what you loved was cooler than being jaded. This bled into our “real” lives enough to make homemade t-shirts that read “Talk to me, I’m on Tumblr” to wear when camping out for Harry Potter movie premiers or Starkid concerts. We brought our obsessions with particular—if not always particularly evergreen—pieces of art into our families and classrooms. The fandom communities had our backs, so what was there to fear of this “real world”? Being a part of something special made us special. We would lay down anything to defend that belonging. Darren Criss at the Globe Theater in DTLA. This photo and header photo by Ana Rivas. Find more of her work at http://ana-rivas.squarespace.com/. Criss, whose acting roles and songwriting overlapped heavily with all three of those communities, quickly became the center of that world, and subsequently my favorite person on the planet. I don’t buy the idea that you feel the deepest chasm of emotion you’ll ever feel in your life as a teenager, but it is hard to deny the pure, fluttery-eyed affection a sixteen-year-old girl has for an artist who speaks to her. Even throughout this article, I have had trouble referring to Darren as “Criss” instead of “Darren,” because “Darren” is what I called him back then, as if he were a personal friend, whose art created a safe space for me to dissect the jarring awareness of my own growing up. Back then, I too had been absorbed in that suddenly-accessible, Tumblr-driven feminist theory, and was keenly aware that the obsession I had could be construed more as school-girl crush than intellectual appreciation. Too often girls’ obsessions gets dismissed as frivolous (or worse: “rabid”) even though, from the Beatles to One Direction, we permanently carve out cultural space for our favorite artists with devotion as our chisel. Even the recent rise of Lin Manuel-Miranda, whose fanbase mirrors the A Very Potter Musical Tumblr fanbase from seven years ago, follows the pattern. I don’t know if A Very Potter Musical will be chiseled in history for the rest of time the way Hamilton surely will be, but I do know girls will readily make room in their hearts and lives for the art they love, an exercise with value beyond what society gives it. 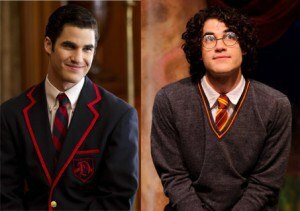 Darren Criss as Blaine Anderson on the right and Harry Potter on the left. About halfway through the show, Criss moved to the keyboard to play “This Time,” a song he had written for the series finale of Glee. Contemplative, nostalgic, and hopeful, the song makes as much of a commitment to the past as it does to the future. I had stopped watching the show long before the final season aired; for a moment I felt a twinge of desire to rewatch and rediscover who I was when I loved Glee. Since the show fell off my radar, I had settled into a long-term relationship, moved to a new city, started a career, and decided a few critical things about the woman I was going to become. It seemed a natural consequence of growing up that my passions no longer lived on the tip of my tongue and that my opinions on art were more deliberate and thoughtful, but I had to ask myself where that girl was these days—the one who loved completely, who spoke eagerly, and who would push back hard against being dismissed for the things she loved no matter the setting. Right on cue, “This Time” rolled into an absolutely explosive cover of Katy Perry’s “Teenage Dream,” the first song Criss had ever sung on Glee. When he had played this song back at the Roxy in 2010, he lacked the capability to make the cover the transportative performance that he spectacularly delivered now. With its dreamy lyrics turning frantic and desperate in Criss’s voice, adult life’s claustrophobia was the culprit that prompted the escape instead of teenage whimsy. In a show devoted to sentimentality, “Teenage Dream,” a song longing for the simplicity of young life, was the best performance of the night. With no time for an encore (thanks to a “totally worth it” performance of the AVPM opening number, complete with cast members whose faces I would recognize anywhere), Criss wrapped with Homework, somewhat hurried. But while it didn’t get the deserved time on stage, Homework’s spirit responds to the rawness of Human with a brash and substantial sound, winding in and out of big Broadway-esque choruses and yet holding its cards surprisingly close to the chest. Criss’s evolution from one EP to the next reveals an artist whose sense of self has had the benefit of seven years’ stability and reflection, and has brought only the best elements of his show business career with him. And the EP recognizes, from its sweetly melancholic “Going Nowhere” to the Disney-esque cover of Les Mis’ “I Dreamed a Dream,” that time will take you along with it no matter how much you try to look back at the past. As we left the concert, Nicole and I relived memories of driving up and down the coast to see Darren, Starkid, and Glee any chance we could. It was sweet—and, surprisingly, not at all bittersweet—to realize how much we had grown, and to compare that alongside with our favorite artist. Criss used the concert to reminisce about his past but, ultimately, he invited us into his future. He has returned with more mature, sensitive songwriting at his fingertips and a variety of experiences at his back. The work he’s done to get here isn’t shied away from, but respected, challenged, and honored in his new life. Art itself is just a matter of speaking eagerly and loving fully; with the Homework EP, Darren reminds fans old and new that the audacity to create, connect, remember, and build community anew are skills we don’t need to leave behind with our teenage dreams.